Win up to £25,000 and support COT at the same time. The more people we recruit to the lottery the more money we make…its simple! By playing the Unity weekly lottery, for each £1 entry, you have the chance of winning a range of prizes including a £25,000 jackpot! Fill an empty Smarties tube with £1 coins or collect your spare change in a jar; you'll be surprised at how it all mounts up! Raise Money just by searching the web - www.everyclick.com is an internet search engine with a big difference - it donates half its revenues to charity! As you can see there are so many things you can do to help us raise the vital funds we need to continue our work. Please do contact us for a chat about what you could do to help. 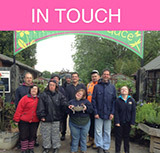 Call the Fundraising team on 01233 861 493 or 01233 860 806.